The signing of the contract for two new hotel projects is driving further the growth of MEININGER Hotels in Germany. In the future, the hotel group which currently operates 12 properties in Germany will also be present in Stuttgart and Bremen. “We are very well set up for these two cities with our hybrid hotel concept,” states Doros Theodorou, CCO of MEININGER Hotels. Both hotels will offer private single, double and multiple bed rooms as well as dormitories for up to four people. A guest kitchen and game zone which are both typical for MEININGER Hotels will also be available in both properties. Stuttgart: Central hotel in the state capital – The contract signing seals the second project for MEININGER Hotels in the German federal state of Baden-Wuerttemberg. 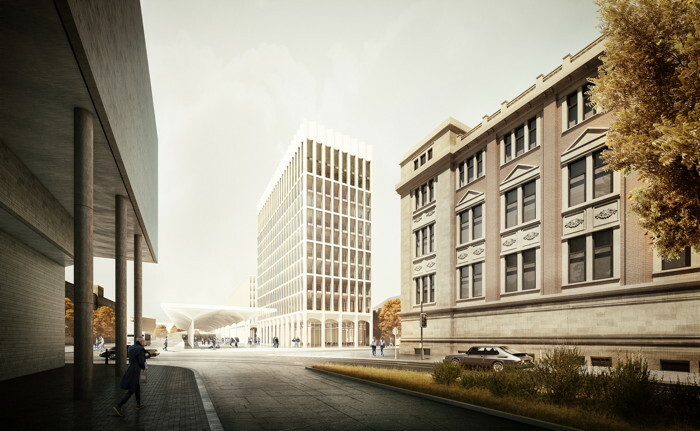 The planned new building in a central Stuttgart location covers a gross floor area of ​​6,900 sqm on four floors. In addition to 156 rooms or 460 beds, the accommodation will also have 20 parking spaces. The hotel is scheduled to open in fall 2021. Many Stuttgart attractions such as the New Palace, the Porsche Museum, the Mercedes-Benz Museum, the zoological and botanical garden Wilhelma, the market hall as well as the Karlshöhe ridge and the Neckar Park are easily accessible from the hotel. The central station, the convention center and the airport are also very well connected from the hotel. In the Baden-Wuerttemberg area, another MEININGER Hotel is currently under development in Heidelberg. The hotel is scheduled to open this year. Bremen: New construction project at the main station next to the new long-distance bus terminal (FBT) – In cooperation with the property developer Buhlmann Immobilien, a MEININGER Hotel will be built at Bremen’s main station next to the new FBT. For the hotel group it is the first project in Bremen. At the Bürgermeister-Smidt-Strasse 15, 126 hotel rooms or 378 beds will be installed on a gross floor area of ​​more than 5,100 sqm. The completion of the eleven-storey hotel building is scheduled for spring 2022. The company Robert C. Spies Gewerbe und Investment GmbH Co. KG acted as intermediary. “The historic Schnoorviertel and the town hall are landmarks for the significance of the Hanseatic city and its moving history. These and many other sights and unique places attract increasing numbers of visitors to the city on the Weser every year. The proximity to long-distance bus and train connections is perfect for our future hotel guests. The MEININGER Hotel Bremen completes the area around the central station and the new FBT,” explains Hannes Spanring. Located between Bremen’s Old Town and the central station, the hotel is well connected to public transport. The central station is within walking distance in 2 minutes. The planned FBT is located right next to the hotel. Numerous shopping and entertainment venues are located within walking distance in the city center, the Old Town and the nearby shopping center City Gate. Attractions such as Überseemuseum, historic town hall, Böttcherstraße, Schnoorviertel, Weser Stadium and the harbor can either be reached on foot or by public transport from the hotel. The airport is around 15 minutes by car. In 2019, MEININGER Hotels has already opened two new properties, in Munich and Budapest. With the opening of the MEININGER Hotel Paris Porte de Vincennes this summer the company will enter the French market.